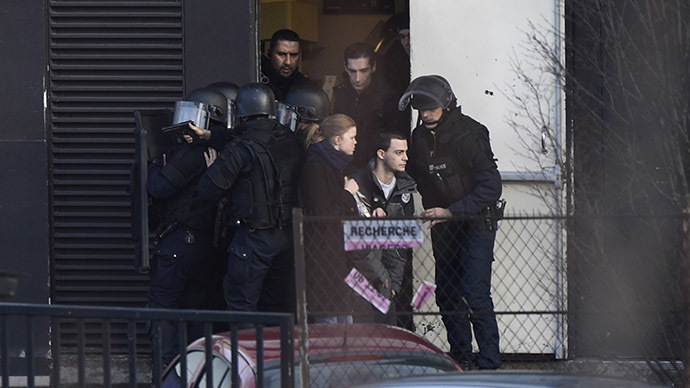 A three-day manhunt for the Charlie Hebdo attackers ended dramatically with two hostage situations, in which 7 people were killed, including the gunmen. 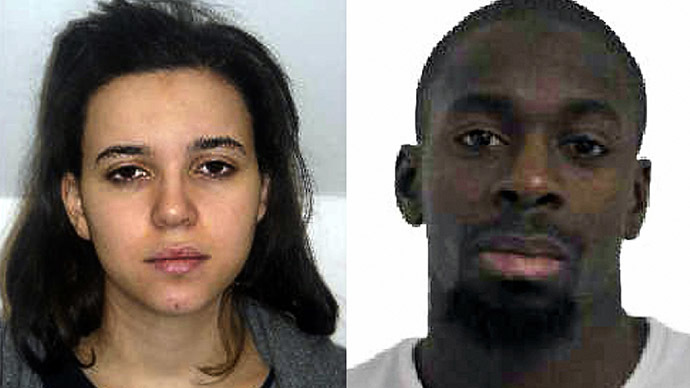 Casualties came in the Paris kosher store crisis that revealed more terror accomplices. Friday’s events played out at two separate locations: in Dammartin-en-Goele northeast of Paris, where Wednesday’s shooting suspects, Cherif and Said Kouachi, were found, and in the capital’s Porte de Vincennes neighborhood, where a Kouachi-linked gunman named Amedy Coulibaly took hostages at a kosher grocery store. 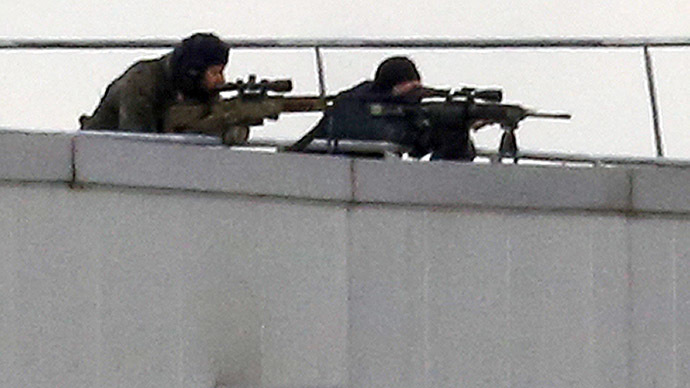 The Kouachi brothers were surrounded at Dammartin-en-Goele printworks and reportedly opened machine gun fire at police. A worker barricaded himself in the same building and was initially believed to be a hostage, but it turned out the gunmen had no idea he was there. The 26-year-old Lilian, who reportedly hid “under a sink in the canteen” upstairs, was terrified, but nevertheless managed to tip the police off with some valuable “tactical” information. He also texted his father with the following: “I hid on the first floor. I think they killed everyone. Tell the police to intervene,” reported Le Figaro. Security forces had the building surrounded for most of Friday. The assault began at a time when several loud blasts were heard and smoke was seen rising over the building. 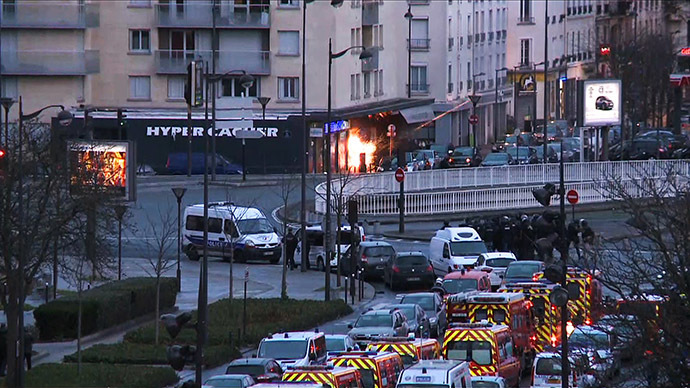 Police decided to launch the assault when they learned the gunmen had started praying, according to BFMTV. It was later revealed that the two brothers were armed with Kalashnikov rifles, Molotov cocktails and a loaded rocket launcher. They emerged firing on security forces, injuring one policeman during a shootout captured on camera. Roughly around the same time the Charlie Hebdo attack suspects were surrounded, a man of West African appearance entered a Paris kosher store armed with automatic rifles. Shortly after going into the shop, the gunman shot four people and took 16 other people hostage, some of whom managed to hide in the store’s refrigerator. The Porte de Vincennes gunman, identified as Coulibaly and confirmed as the killer of a policewoman earlier on Thursday, demanded freedom for the Kouachi brothers, threatening to kill the hostages if police launched an assault. 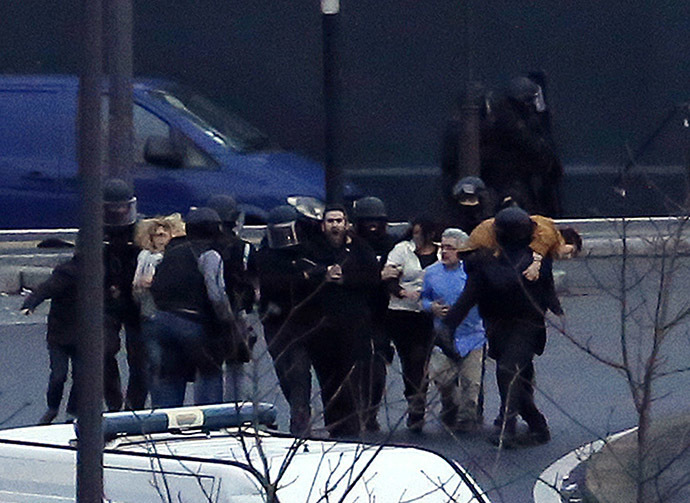 Security forces stormed the Paris store almost simultaneously with the Dammartin-en-Goele printworks assault. Police used flash grenade and shot the hostage taker dead. Shortly before getting shot by police, he told the French BFMTV channel that he had links to the Islamic State (formerly ISIS/ISIL) jihadist group and had “synchronized” his actions with the Kouachis. It’s reported that the gunman didn’t end the call, which let police know that he had started praying and so they launched the assault. The tragic events began on Wednesday, when Cherif and Said Kouachi carried out a bloody rampage at the French satirical magazine Charlie Hebdo offices in central Pairs, killing 12 people, including two policemen. The man’s motives were still unclear after he surrendered to police following nearly nine hours of negotiations and led the hostages go unharmed. Local authorities denied the incident had any connection to this week’s terror attacks. French Prime Minister Manuel Valls on Friday said that he is not ruling out the possibility of more terrorist attacks against the country. “France has faced an unprecedented level of terrorism. We cannot exclude the possibility of new attacks against the country. France is leading a real war against terrorism,” Valls said in a statement.